The badge featuring a small oak leaf that Benjamin Kavanagh wears on his military uniform signifies more than the ROTC commander’s promotion as an Army commissioned officer. This insignia also denotes Kavanagh’s lifelong goal of becoming a Lieutenant Colonel and battalion commander for collegiate ROTC cadets. This month, the U.S. Army recognized Kavanagh with this promotion from Army Major to Lieutenant Colonel and confirmed his eligibility for Army Battalion Commander. 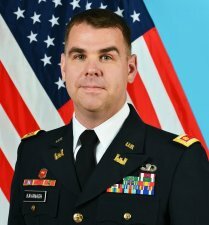 Governed by the U.S. Department of Defense, the promotion allows Lt. Col. Kavanagh to compete for and command a unit of 300-800 soldiers or serve as a brigade task force executive officer. In addition to serving as Lieutenant Colonel in the U.S. Army, Kavanagh has agreed to a 3-year term as Edinboro University ROTC commander with the possibility of an immediate fourth year. Dr. Scott Miller, dean of the College of Arts, Humanities and Social Science and the School of Business, said that he appreciates the efforts Kavanagh brings to the student-focused ROTC program. Kavanagh said that his decision to become an ROTC commander was solidified when he oversaw the commissioning of his first group of Edinboro University graduates in May 2018. “The first group of cadets out the door at Edinboro made me realize that we are giving back to the Army and adding our little slice of the military experience,” he said. Kavanagh’s most recent assignment was with the U.S. Army Africa 517th Geospatial Planning Cell as the officer-in-charge. Previously, he was the lead planner for developing the engineering and site master plans in Senegal, Ghana, Gabon and Uganda and was deployed to Cameroon to construct a contingency location. In his 16 years of military service, Kavanagh has become highly decorated with the Meritous Service Medal, Army Commendation Medal, Navy Commendation Medal, Army Achievement Medal, National Defense Service Medal, Afghanistan Campaign Ribbon and the Global War on Terrorism Expeditionary Medal. Kavanagh, a native of western Pennsylvania, lives in the Erie County area with his wife, Emily, and their sons, Owen (10) and Daniel (7). For more information about the Fighting Scots Battalion and Lt. Col. Kavanagh’s work with ROTC, visit www.edinboro.edu/ROTC.